The GRAS 26CA 1/2'' CCP Standard Preamplifier is a small, robust unit and uses a CCP power supply (ICP ®), e.g. GRAS 12AL. It has a very low inherent noise level, a large dynamic range and a frequency response from below 2 Hz to above 200 kHz. Its small ceramic thick-film substrate has a very high input impedance, and is shielded by a guard ring to minimise the influence of stray capacitance and microphonic interference. The 26CA is delivered with Generation II TEDS. The calibration data is programmed into the built-in TEDS according to IEEE 1451.4 using UDID I27-0-0-0U. If your measurement platform supports Transducer Electronic Data Sheets you will be able to read and write data like properties and calibration data. 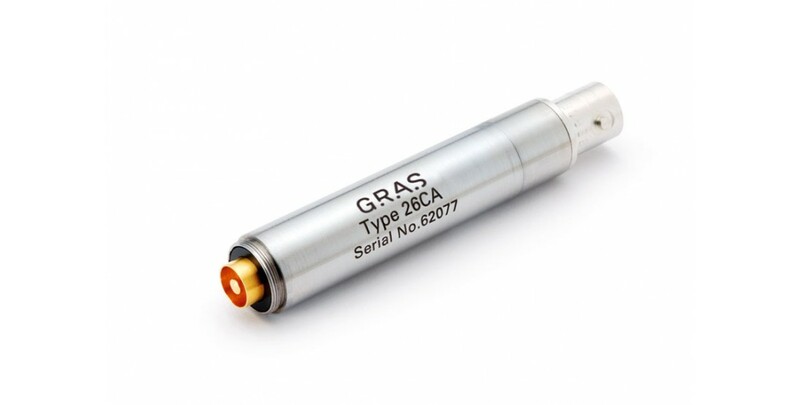 It can be used with all GRAS prepolarized microphones, namely: 1/2" microphones: GRAS 40AE, 40AD and 40AQ 1/4-inch microphones: GRAS 40BE and 40BD, using the optional 1/2"-inch to 1/4-inch adaptor RA0019. It has an integrated BNC output connector. The casing is made of stainless steel for maximum strength and durability. ® ICP is a registered trademark of PCB Piezotronics Inc.